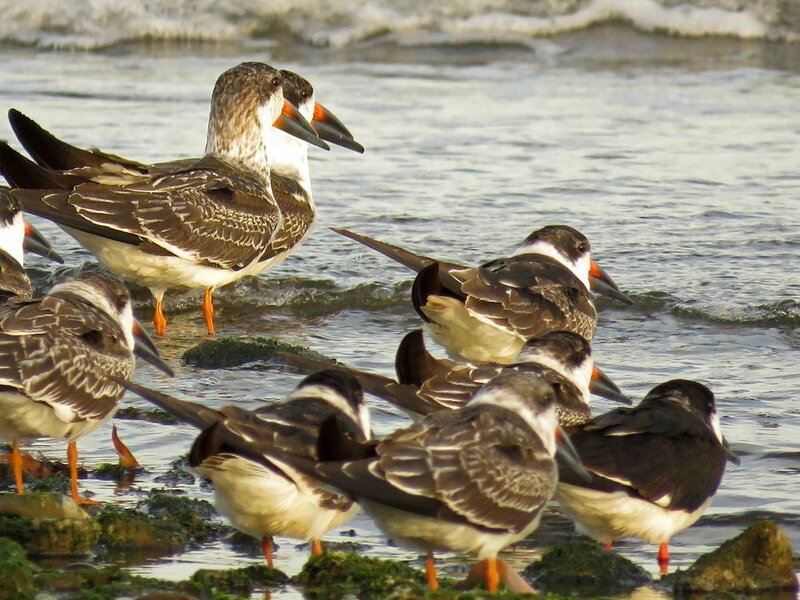 On October 2, 2018, a young black skimmer (Rynchops niger) was seen hanging out on the beach at Breezy Point, Queens, with more than a hundred American oystercatchers, just trying to blend in. Of course, photos and a video were the result. These black skimmers (Rynchops niger) were seen on the beach at Wolfe's Pond in Staten Island on October 31, 2017, and November 4, 2017. I spent a very short time with them on the 31st, but was able to watch them for almost an hour on the 4th. You can see the longer lower bill that distinguishes these birds from other shorebirds. This longer lower mandible is dragged through the water as the bird tries to catch small fish. There are two Filming the Feathers videos of this flock of skimmer, showing the birds resting, skimming and flying around. The glimpses of them opening those big mouths are fun. I didn't add music, but instead left the sound of the ocean and wind, plus the occasional squawking. This group of photos were taken on October 31, including some grabs from the video. These photos were taken on November 4, 2017.